At the end of this week, we will have brought our last summer camp of the year to a close. It's been a whirlwind of a summer, and - after 11 camp sessions and over 100 campers - there's a ton of stories to share. What follows is only a short, abbreviated handful. Junior Explorers race to discover what insects will fall out of the next tree. Campers discovered new loves. 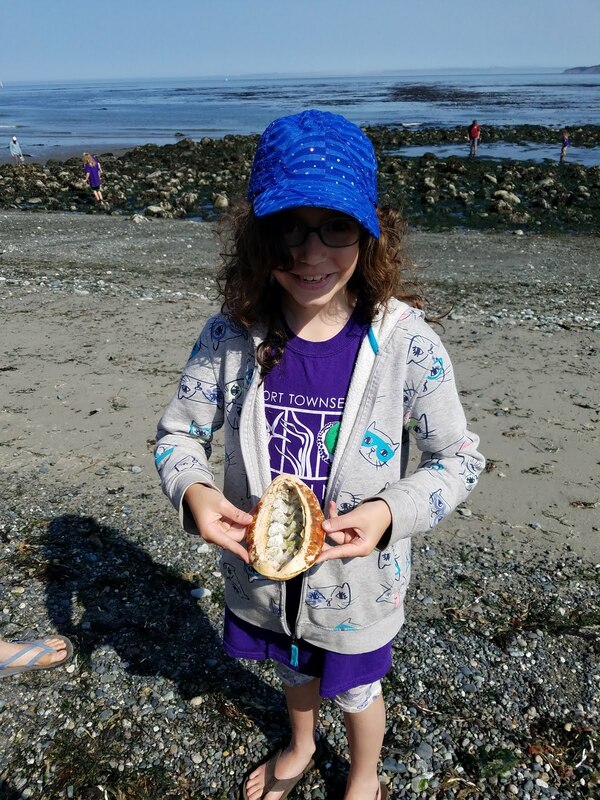 One Marine Biology camper tumbled into the world of chitons, and spent the better part of the week chasing down every specimen she could find (living, and quite a few previously scavenged). Many encountered the strange, alien world of plankton for the first time, and left with a greater appreciation of the little things in our seas. Still others hung out with the insects - aquatic and terrestrial - and learned that bugs can be creepy, crawly and quite a bit cool. Chitons were the rising star of Marine Biology camp. Discovering new plankton was always a hit in the Marine Exhibit. Campers were challenged. To all the groups that successfully completed the water bottle team-building challenge, I salute you. Seeing you grow as a unit as the week progressed made my inevitable defeat absolutely worth it. Team-building games were perfect for working through some of that pre-camp energy! Campers got their hands dirty. Seal Pups learned about the marine critters in our touch tanks while feeding the urchins, sea stars and flatfish. Junior Explorers rooted through tide pools, shook bugs out of trees, became birds and moved like marine mammals. Coastal Explorers hunted for aquatic macroinvertebrates and practiced testing the salinity, pH and turbidity of our marine waters. Marine Biology campers got down in the mud to sift for worms and dig for clams. A kelp boa makes the best tide pooling accessory! Sifting for aquatic worms can be hard work. Campers took control of their own learning. Congratulations to all of the Afoot & Afloat campers for their spectacular research projects this summer. Through your efforts, we measured temperature, pH and salinity fluctuations within the Puget Sound - and even documented an estuarine mixing event! Campers were inspired. One group of campers took steps to limit lunchtime waste, nearly halving their use of disposable plastic in just 24 hours! Other groups chose to encourage conservation actions - such as reducing plastic waste, carpooling, and limiting water usage - through beach art. One Junior Explorer even chose to express her desire to conserve the Salish Sea through a collaborative song and dance. Beach art was a popular (and fun) way to spread conservation messages! A driftwood stage set the scene for a fully-choreographed song and dance. It's difficult to capture all that happened this summer in a single blog post. To all the campers I worked with, thank you. 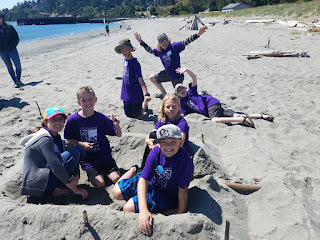 Your enthusiasm for all things marine biology and beyond made the summer camp season an absolute blast! Written by PTMSC Summer Camp Intern Assistant Ellie Kravets.